As Carnegie Mellon’s registrar for 24 years, John Papinchak keeps a busy schedule. His office supports more than 60 academic units, maintains over 100 classrooms and computing labs, and keeps records for more than 13,000 students each year as well as for all CMU alumni. Papinchak and his team of 11 work with departments across the university to schedule about 2,000 classes each semester. They also oversee student registration, support the student information system for faculty, departments and administrative staff, and produce all student documents — from enrollment and degree verifications to transcripts and diplomas for students at a dozen teaching locations across the globe. Papinchak credits his team and the academic departments, especially the academic administrators, for completing the puzzle each semester. 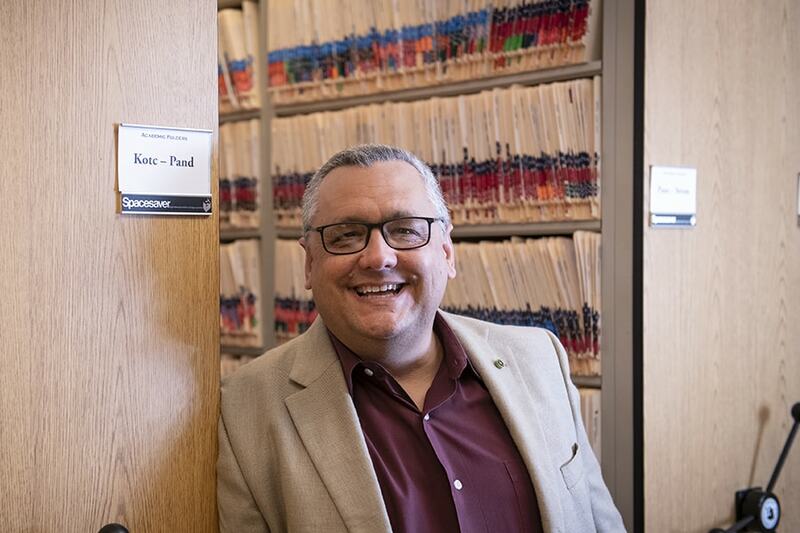 Papinchak said he loves the opportunity CMU affords him to try new things to make administrative processes more efficient for students, faculty and staff. Some of those new wrinkles include faculty submitting grades to his office via a secure website, and giving students the ability to order pdfs of their transcripts and certified copies of their diplomas online. “It’s been rewarding to do different things. CMU has supported us in trying to make some new and innovative changes,” he said. Papinchak earned his bachelor’s degree in chemical and biomedical engineering at CMU in 1984. “I graduated on a Monday and started working as an admission counselor and assistant director of Summer Studies the next day,” he said. Papinchak earned a master’s degree in public policy and management from the Heinz College in 1990. He said his information systems classes have helped him as registrar. “And my engineering degree taught me how to define problems and build solutions,” he said. In his spare time, Papinchak, a former high school soccer referee, is an administrator for the Western Pennsylvania State Soccer Referee Committee. He also likes to fish, hunt and garden. “Gardening is my biggest hobby. I’m growing tomatoes and peppers,” he said. University Registrar John Papinchak is a Carnegie Mellon alumnus, who earned his bachelor's degree in chemical and biomedical engineering and his master's degree in public policy and management.